Parents my second challenge is not to waste your time. My first challenge was not waste your devotion. Don’t waste your devotion is a simple challenge to parents to live their faith in the light of day. 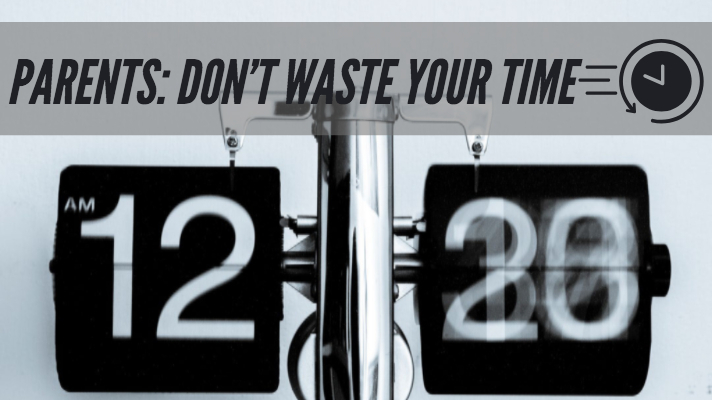 Don’t waste your time means that you as a parent understand that your time is limited and that your time is crucial. You understand that our time with our kids goes really fast and your influence huge but diminishes over time. You have to use the time and the influence that you have while you have it because where you spend your time and how you spend your time shows your kids what is valuable to you and important to them. We love our kids and want what is best for our kids so we take them on the best vacations, throw elaborate birthday parties and drive them all over for sporting event travel teams. Are these wrong? No. Can they give our kids wrong idea about what is most important to us and most valuable to them? Yes, I think we can. We must invest our kids time in things that are eternal. Take them on great vacations, but walk them through a catechism. Throw them a great birthday party but teach them to be generous with their time and money. Put them in sports but teach them that nothing can replace a community of faith. How do you intentionally invest your kids time in what matters most? Parents catechize them in the truths of the faith – We use the New City Catechism. – We like it because it is 52 weeks and has a child and adult version of every question. The Westminster Shorter Catechism is also very good. Start going over them every week. We have 7 questions that we call first steps next steps – they offer three quick answers and give you a link to a 7 page PDF with more information if you want to download it. We only have a limited amount of time to influence our kids we can’t waste our time. Do family worship. – Family worship is something that Christian families have practiced for years. The basic format is Scripture reading, Hymn singing, and prayer. There are many great books that teach how and why family worship is so crucial. Parents lead your kids by demonstrating to them what faith and devotion look like. Pray with your kids at dinner or bedtime. There are few times in your kids day where you have their attention like dinner and bedtime. Don’t waste those times read a scripture or pray with them. Parents redeem the time you have. Your time is limited your influence is diminishing use it to intentionally point your kids toward what is most valuable to you by investing your time and their time in what matters most. Teach them to enjoy the good gifts God gives us but not at the expense of knowing and loving the giver of those gifts. Parents don’t wait till a convenient them or till you have the right resources start today. Do anything do something. Doesn’t what you do start right away. – Even if you struggle to understand or feel ill-equipped show them what faithful love of the word looks like. We have to start doing something. Lastly, parents use every circumstance as a tool to teach your kids to justice and mercy of the omnipotent and sovereign God that we serve. R. Kent Hughes says this about Abraham. Abraham was also responsible to teach righteousness and justice to his offspring. “For I have chosen him, that he may command his children and his household after him to keep the way of the Lord by doing righteousness and justice, so that the Lord may bring to Abraham what he has promised him” (v. 19). God desired that his covenant people be a people who did righteousness and justice to everyone, regardless. This would become a major purpose of the law—to love your neighbor as yourself (cf. Leviticus 19:18; Galatians 5:14). It is here that Sodom and Gomorrah provide the starkest, darkest contrast because their lifestyle was the absolute antithesis of righteousness and justice. And when God judged Sodom and Gomorrah, their ruins would become a powerful teaching tool to Abraham and his descendants. There on the border of Israel, the eerie, burnt-out, sulphur-stenched remains of Sodom and Gomorrah permanently testified to what happens to a people who reject righteousness and justice. A powerful reminder for us that we are to teach our kids righteousness and justice and the result of living lives in opposition to the righteousness and justice of a holy God. May God help us to be faithful with our time to model for our kids what we find most valuable in life by how we invest our time and where we invest their time.